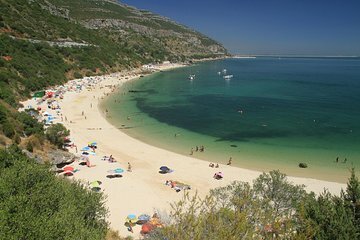 Discover the beauty of the Arrábida region and visit the lesser-known beaches south of Lisbon on this private 4.5-hour tour. Your guide will pick you up at your hotel and take you on a stunning drive through the south of Lisbon, where you will see the stunning landscapes of local vineyards. Linger on the picturesque hidden beaches of Galápos, Figueirinha and Setúbal. Sample local pastries and cheese in Palmela and Azeitão and visit the statue of Christ before returning to Lisbon at the end of the tour.